From the first few minutes, Director Susanne Bier and Writers Le Carre and David Farr draw the audience in and keeps us captivated with an enthralling tale. In 1993, John le Carre (The Russia House) debuted a best selling novel entitled The Night Manager. Twenty-three years later, the story is once again resonating with audiences worldwide as a 6-part mini-series which aired on the BBC (UK) and AMC (USA) this past spring. With intrigue, suspense and drama oozing from almost every scene, the story draws one in and keeps you coming back until the very end. As television shows go, this one is well done and worthy of the audience's attention. Jonathan Pine (Tom Hiddleston; Thor: The Dark World) is the night manager of the Nefertiti hotel in Cairo, Egypt during a time of political uprising. One of the guests of the hotel, Sophie (Aure Atika; World Without End), is the mistress of a shady character who entrusts her with documentation of an illegal arms deal involving Richard "Dickie" Roper (Hugh Laurie, House). After Jonathan gives copies of the documents to British authorities Sophie ends up dead, leaving Jonathan feeling responsible and angry. Angela Burr (Olivia Colman; The Iron Lady) is the British agent hell bent on destroying Roper. When she approaches Pine to go undercover, he is, at first, reluctant, but ultimately agrees to infiltrate Roper's organization in order to bring Roper down and make him pay for Sophie's death. In order to do that, he must risk his life and join the underworld criminal element. Once he finally gains Roper's trust, Jonathan finds himself in a real life game with deadly consequences. From the first few minutes, Director Susanne Bier (Things We lost in the Fire) and Writers Le Carre and David Farr (The Ones Below) draw the audience in and keeps us captivated with an enthralling tale. Bier's style makes us spectators in a deadly game, set in a backdrop of lavish settings and the Middle Eastern desert. While she uses these locations as props, she doesn't showcase them so as to not distract the viewer from the plot. One of the most brilliant aspects of this show is the casting. Hiddleston is engaging as Pine, hotel employee turned high stakes spy. I can see why his name has been tossed around as possibly the new James Bond (though I ultimately can't see him getting the job), as he portrays an air of ease while maintaining a secretive nature. He successfully balances his role of "servant" with his underlying demeanor of a man in control. Laurie is another gem and the two gentlemen have a chemistry that make their scenes flow seamlessly. So much can be said with a mere glance and these actors do it very well. Colman is terrific as Burr, the agent who would steam roll over anyone in her path for justice. Elizabeth Debicki (The Man from U.N.C.L.E.) is elegant, yet troubled, as Roper's girlfriend who falls in love with Pine. Again, a subtle glance can speak volumes in the case of these two. My issues with the story are minimal and fairly inconsequential at best. Besides Burr, the two other main females in the show fall hopelessly for Pine and while I will admit Hiddleston is dreamy to look at, it's not that likely that both ladies would want him. It's also convenient that said females both happen to be entangled with Roper on some level. My other grievance is one of the bigger plot points. If a man like Roper spends many years running a smooth illegal operation and suddenly things start going amiss just when the new guy arrives wouldn't that be the first person he would look at not the last? I also found the ending too anticlimactic, but, then again, I'm sure I'm used to the big, extravagant fight/chase scenes that permeate most of the big budget blockbuster films out in theaters in the past several years. The Blu-ray is presented in 1080p High Definition video with a 1.78:1 aspect ratio. While I feel many of the colors are intentionally muted, there are still some striking visuals as the characters span the globe in a number of exotic locations. The DTS-HD Master 5.1 audio is sharp and clear, especially doing the weapons explosions. It also highlights the soundtrack, though, for me, the music was often a distraction. Sadly, the Blu-ray doesn't have any special features, which was something I was looking forward to. The six-part series wraps up the novel in a nice big bow that has left audiences and critics singing its praises and due to the success of the show, there is talk of a second story that would be completely brand new; but, I must admit, I am torn about the idea. If le Carre and Farr, along with the original cast (perhaps sans Laurie), were to return, they could make a strong second season. However, as so many sequels never live up to the original, I'm skeptical, at best, right now. 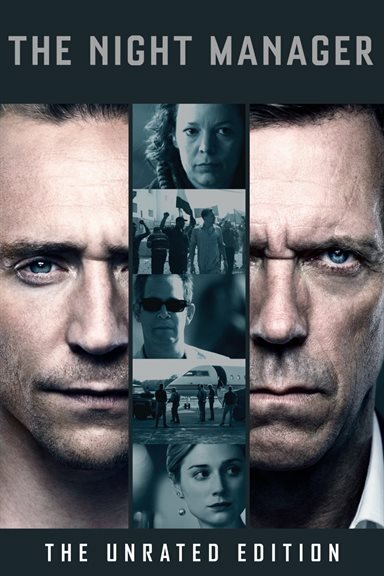 Download The Night Manager from the iTunes Store in Digial HD. For more information about The Night Manager visit the FlickDirect Movie Database.